The pas de deux, performed for weeks by Nicolas Sarkozy and Angela Merkel, is slowly easing eurozone members into becoming the United States of Europe. Frankly as political theater, it's enormously well-executed and deserves a Broadway Tony. The pas de deux, performed for weeks by Nicolas Sarkozy and Angela Merkel, is slowly easing eurozone members into becoming the United States of Europe. Frankly as political theater, it's enormously well-executed and deserves a Broadway Tony. The first act concluded last week when the backsliders, Greece and Italy, were silenced after their leaders and cabinets were dumped and replaced with unelected soft receivers who will do as they are told by the rest of the eurozone. This week, act two featured starring roles by the "Merkozy," which is a press nickname for Europe's odd couple. Their routine was, and has been, flawless even though it is well worn: They are featured in news footage warmly greeting one another before each of their regular get-togethers. Then, after each confab, they are filmed pledging their loyalty to the European Project and to resolving the euro crisis. Their duet ends and they then performed their solos. 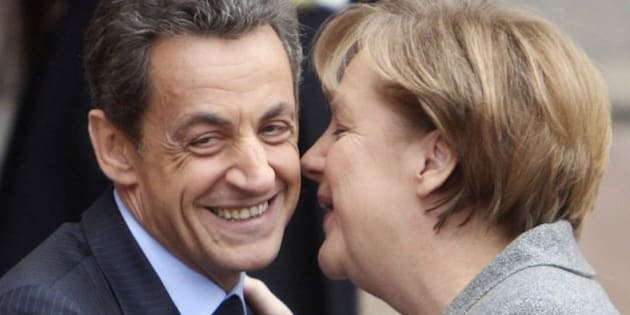 Sarkozy does his grand "vision thing" first, which is followed by a muted pronouncement by Merkel the following day. He always goes first, lest everyone catch on to the fact that Germany is calling the shots. On Thursday, Sarkozy went over the top. He strode onto a gigantic stage in Toulouse with a few thousand party faithful in a sea of seats and made a landmark speech in front of a French flag as big as a bungalow. His message was grand and optimistic and spoke of the reconstitution of the continent into a united Europe. He also issued a warning that anything less was simply incomprehensible. On Friday, Merkel performed her low-key messaging perfectly. She traded in her usual loud pantsuits for an understated black outfit. She delivered her speech behind a modest podium to her fellow parliamentarians. She said that Germany was committed to a eurozone fiscal union but added that this would take years. Her stolid, non-threatening message was aimed, not so much to her fellow parliamentarians, but to the neighbours who psychologically need assurance that the response to their crisis is not simply an economic version of the sovereignty grabs that afflicted Europe until 1945. If you think I'm cynical, just imagine how investors would have reacted to Sarkozy giving a muted speech about this mess taking years to clean up, or how the world would have reacted to Merkel standing in bold colours in front of a German flag as big as a house telling thousands of Germans about a grand vision to centrally control all of Europe. These sensitive and choreographed performances have been appropriate, given the continent's brutal history. But the Merkozy duet was enhanced this week with walk-ons from three other critically important cast members. "I demand of Germany that, for your sake and for ours, you help [the eurozone] survive and prosper. You know full well that nobody else can do it. I will probably be the first Polish foreign minister in history to say so, but here it is: I fear German power less than I am beginning to fear German inactivity," he told his Berlin audience. If that didn't seal a deal, then the move on Wednesday by the world's biggest central banks, certainly did. Unannounced, they committed to backstop the world's banks with liquidity to avert another Lehman Brothers moment. This removed any doubts that the stars in other dramas -- the United States, China, Brazil, et al -- would simply let Europe atomize. Another important element was allayed by Poland's Sikorski who leveled a broadside at British Tory backbenchers who have been whining and gloating about the euro and second-guessing what should be done. He said simply: "If you can't join, please allow us to forge ahead. And please start explaining to your people that European decisions are not Brussel's diktats but results of agreements in which you freely participate." Such a pointed remark, from a country devastated by war then communism, helped David Cameron chill unruly backbenchers who want to turn back the clock and opt out of the European Union altogether. This permitted him to play a major role again, and on Friday, as Merkel was speaking in her parliament, he arrived by limousine at the Elysee Palace to listen, not lecture, Mr. Sarkozy before next week's summit. He was part of a solution. The banks and markets loved it all and by the close of the week, Italy and Spain's bond spreads were dramatically lower and markets up. Of course, the U.S. recovery also helped buoy spirits, but, make no mistake, the pas de deux was the big hit. So now the world enjoys another intermission before the curtain raises again, on Dec. 9, for a final act. This time, there will be 27 in the cast and the whole world will be watching.